Pérez-Feria reflects on how his parents' marriage has inspired him to find the perfect partner. As I write this, on my mother’s birthday no less (she’s 84 and fabulous, thanks for asking), I feel compelled to look up at the wall behind me in my home office to once again take in a striking, black-and-white photograph of my parents’ wedding day in Cuba watching over me. The beautifully framed, magazine-cover-worthy image is stunning—they look like Rock Hudson and Doris Day in Havana—and it reflects the unabashed joy their four children have aspired to find in a partner for themselves. 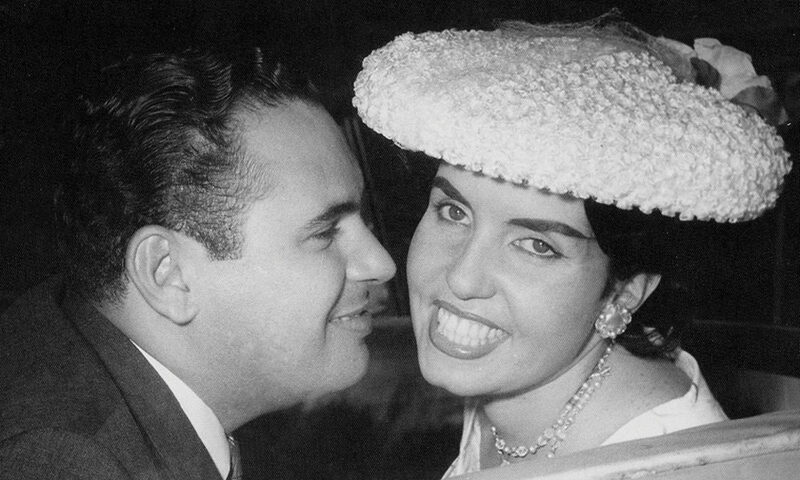 Manuel and Addy Pérez-Feria recently celebrated their 57th wedding anniversary and still clearly exude that transcendent, palpable happiness you can only have when you find your true soul mate. Mom and Dad are quite the example of what a great marriage and romantic partnership can really look like. And how. Not coincidentally, my parents’ ridiculously blissful journey, I believe, is the reason that the very concept of marriage has always been a bit opaque for me to fully embrace. Now, to be clear, the reception after the ceremony? Oh, yeah; I’m all in—I do love a messy party! But the tedious, ritualistic, archaic submission the actual ceremony accentuates has always struck me as so not for me. Not even a little. But being the gregarious, outgoing fellow I purport to be, who’s been genuinely blessed with literally hundreds of dear friends in my well-traveled life, I’ve found myself invited to countless weddings over my post-college years. I’ve witnessed, with varying degrees of laughter and tears, as my friends have embarked on their next adventure with their beloveds in myriad settings, including elopements in Vegas, extravagant nuptials in Sydney, beach affairs in Cabo and, yes, City Halls in San Francisco, Miami and New York City. I’ve been present for so much love that when I’m in a darkened movie theater watching the likes of Julia Roberts or Jennifer Lopez in their latest romantic opus, I realize that I do believe in love and in happy endings. Luckily and, in some ways unbelievably, I, too, have found my happily ever after. Gratitude doesn’t begin to cover my good fortune. My brother, clearly a late bloomer, after a lifetime of searching, finally met his better half a few years ago and is now engaged to be married for the first time. I can’t tell you how excited all of us are for the jubilant couple (she’s easily the very best thing that has ever happened to him). And as I follow their trek toward their pending nuptials, I start imagining the actual ceremony and how deliriously overjoyed that room will be, and I remind myself that kindness and laughter are what our parents taught us so well by example. If the day ever comes that I agree to actually get married, I’ll do it with the knowledge that, when it comes to a forever love, I had the best role models of them all. So, with that, I say “thank you” to these wonderful, silly, caring people, Manuel and Addy Pérez-Feria, for showing me—and everyone they love—what marriage can and should be. Love is in the air, people. Can you feel it? Something borrowed, indeed.